The campaign to eliminate the representatives of the former ruling Republican Party of Armenia (RPA) from key positions is currently at its peak in Armenia. 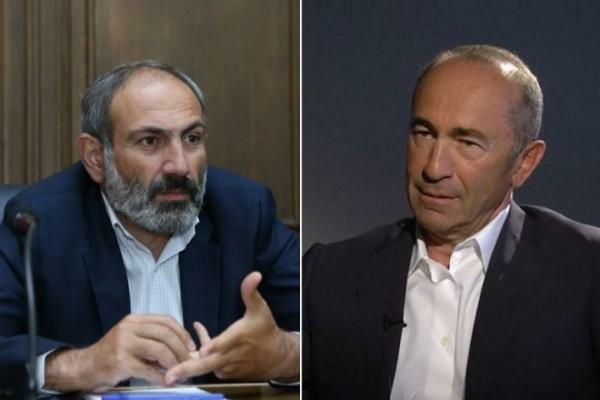 Nikol Pashinyan, “a man from the street” who became prime minister in April, is making serious efforts to eliminate the resistance of the republican elite and to build an impressive electoral support for himself in the forthcoming parliamentary elections. His anti-corruption campaign, as many suppose, pursues mostly political goals, since the arrests of corrupt officials are selective, not systematic. The prosecution of former President Robert Kocharyan and CSTO Secretary General Yuri Khachaturov, as well as former Defense Minister Mikael Harutyunyan is in the focus of attention at the moment. And if the latter is on the run, Yuri Khachaturov, because of his diplomatic status, was released immediately after his arrest, while the arrest of Robert Kocharyan was canceled on August 14 by the Court of Appeal. The Special Investigation Service of Armenia is convinced that the decision on the release of Kocharyan is illegal. Kocharyan considers the charges a fabricated political persecution. The ex-president believes that this may be due to the desire to neutralize his participation in political processes on the eve of the early parliamentary elections. Probably, the other two ex-presidents, Levon Ter-Petrosyan and Serzh Sargsyan, will also be unable to avoid at least contacts with law enforcers, as Robert Kocharyan made it clear at the very first interrogations that he does not intend to go to the bottom alone. The Kocharyan case that created a loud public response can affect the success and even the assessment of the legitimacy of the new government. The Court of Appeal acknowledged that Kocharyan's actions resulted from his status, therefore, questioned the statement of the investigation that in February-March 2008 the second president overthrew the constitutional order. The unexpected decision of the court was interpreted ambiguously. In a traditionally skeptical society, this decision was interpreted only as Pashinyan's tactical defeat, seeing in the position of the court the “Russian trace” and the manifestation of loyalty to the criminal oligarchy. Everyone has heard a sharp statement from the Russian Foreign Ministry that accused the new government of settling accounts with political opponents. On the other hand, supporters of the new government are trying to interprete the release of Kocharyan from arrest on the basis of his immunity status, as a former president, like a manifestation of true democracy. However, Kocharyan's attempts to question the legitimacy of the new government and to annul the results of the “velvet revolution” are more revealing. On Tuesday, before the residence of the Prime Minister in Yerevan, a protest rally was held by a few supporters of the disgraced ex-president with calls for the overthrow of the new government. Many people believe that the credibility of Kocharyan in the society is extremely small, but he is able to change the current balance over timedue to considerable financial and media resources, as well as with the support of the “former” elite. For instance, the ARF party “Dashnaktsutyun” declared its readiness to cooperate with him on Tuesday. In an interview with Radio Azatutyun, the representative of the ARF Bureau Hrant Margaryan said that they do not exclude cooperation with Robert Kocharyan if he informs about this intention. In the opinion of Armenian political scientist Vigen Akopyan, such activity of the current government “in the struggle for truth” can be connected with certain agreements reached during the transit of power. He also believes that Kocharyan's arrest could become a catalyst for the formation of an opposition field in the country where the vacuum was created, RIA Novosti reported. “... Kocharyan actually announced his return to politics. The Republican Party of Armenia and the Dashnaktsutyun understood this message by reacting with official statements condemning the arrests,” Akopyan said. Pashinyan himself refused to comment on high-profile charges, citing the fact that his words could be interpreted as an attempt to influence the investigation. Meanwhile, it is very likely that the “cleansing” among the old pro-Russian elite presents a considerable risk for Armenia - Pashinyan can play a final loss, including Moscow’s military support, which will inevitably lead to the Armenian forces being forced to leave the occupied territories of Azerbaijan in a shame and the potential risks may be even more serious. Therefore, it is obvious that the new prime minister will somehow have to negotiate with Moscow, while preserving the guise of a fighter for justice and democracy. However, apparently, after an unexpected triumph and coming to power, a period of failure has come to his life. The personnel policy of the pro-Western direction and the unpopular reforms already carried out and planned by the new government have significantly changed the attitude of the society towards the new leadership. Revolutionary euphoria gradually subsides and a great disappointment comes to replace it. The authorities' optimistic promises about radical economic changes have little effect on society, which for years of independence has gained immunity to empty populism and false propaganda. Pashinyan's foreign policy also leaves much to be desired. Armenia failed to implement new slogans about rapprochement with the West, but managed to aggravate its relations with the Russian Federation, whose benevolence influences virtually all vital factors of the state's existence. In today's realities, it is more than obvious that Pashinyan needs to “feed” the electorate with real economic achievements, or possess the dictator's power to convince the people that he has the power to break down any resistance. This includes, among other things, personnel cleansing among law enforcement agencies where the representatives of the former ruling party are still strong; for the same purpose, he seeks to form a new parliament, in general, controlled by himself. It is noteworthy that in the power structures, in fact, as in all key industries, only the very top is cleaned out, and the old system, with the exception of “cosmetic” changes, remains unchanged.